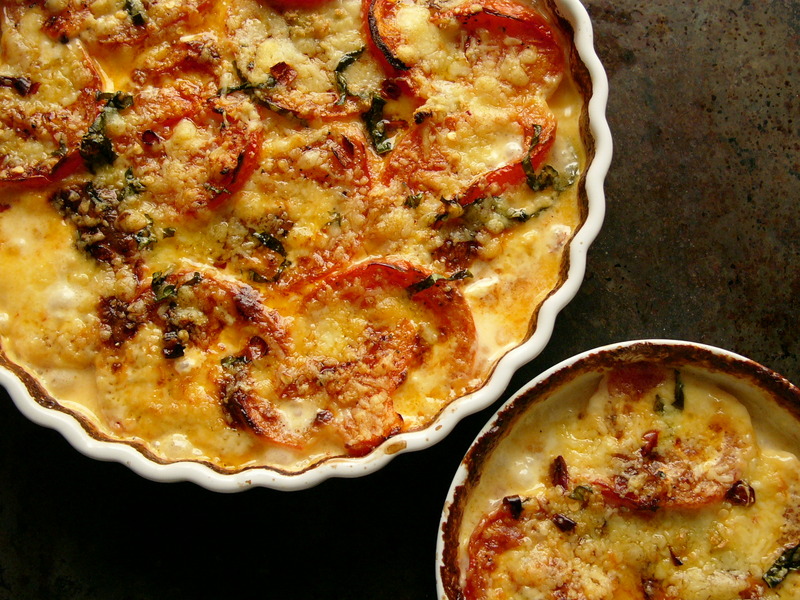 Tomatoes with cream, basil and cheese | WTF Do I Eat Tonight? Did I say summer was back? Well it’s not, not unless you count pouring rain as summer. I went to a barbecue on Saturday night and yesterday morning I was thinking of another: you know, salad, some grilled lamb, a long wait for the sun to set. Instead, I found myself digging out some socks and wondering what to cook indoors. Which is why I was in my corner shop, buying a couple of tomatoes to make some more chilli jam, and noticed that a 5kg box was selling for £2.50. Since a kilo is currently about £2 I did something I never do: let myself be swayed by a food ‘bargain’. Living on my own, with very little space to store perishables, any kind of BOGOF, or 3 for 2, soon looks like a waste of money when I find that I can’t store what I’ve bought and/or half of it goes off. There is nothing (in food terms) that I hate more than waste. But I figured that the chilli jam would use up a kilo or so, there’s another tian I want to try and I remembered that I had a pot of cream, some basil on the window ledge and a lump of Cheddar that was past its best. The combination of all three, baked together in the oven on a wet June day, was just what I needed to lift my culinary spirits. Any old cheese will do (not Brie or Camembert, something hard and grateable is best), I think it would be just as nice without dried chilli and as an accompaniment to some baked chicken pieces or lamb chops it’s really summery, even in the rain. Who needs a smoky old barbecue anyway? 1. Heat the oven to 220°C/200°C fan/gas 7. 2. Wash and slice the tomatoes thickly and lay them in a single layer in an ovenproof dish (something earthenware or glass is probably better than your Sunday roast tray). 3. Pour the cream over the top of the tomatoes, season and bake for about 15 minutes. 4. Meanwhile, peel and chop the garlic clove, wash the basil leaves gently, roll them up and slice them into ribbons then crush the chilli. Grate the cheese, and mix the lot together. 5. Have a look at the tomatoes and if the cream is bubbling up, take it out of the oven, cover it with the cheese mixture and return to the oven until the cheese is bubbling too. 6. Season to taste. Yummy straight from the oven but I bet it’s quite good warm or even cold later on too. You can make individual ones too; just reduce the quantities and cooking time. This entry was posted in One pot, Recipes from magazines and newspapers, Spring vegetable recipes, Summer recipes, Vegetarian recipes, Wheat-free and tagged baked veg recipes, cheese recipe, tomatoes recipe, vegetarian recipes, wheat-free recipes. Bookmark the permalink.